I never get tired of banh mi sandwiches. They are quick to make, always satisfying, and with so many variations, they are never boring. Besides the roasted chicken version, I also make this meatball version quite often. The meatballs have all the flavor requirements of a typical Vietnamese dish – sweet, salty, and a little umami. Yes, I know that ‘umami’ is over-used these days when describing food but no other word seems fitting for that particular savory, salty, slightly pungent flavor combination that fish sauce imparts. The fish sauce ties everything together in the most delicious way. I use lean ground turkey to make this sandwich healthier than the original recipe which uses ground pork. The seasonings and herbs make the turkey meatballs so flavorful that you don’t even miss the pork. The meatballs freeze really well so I often double the recipe and freeze any leftovers to have on hand for quick meals later. Throw the meatballs on a crusty baguette with some cilantro and pickled carrots and go enjoy summer. Lightly spray a rimmed baking sheet with cooking spray. Gently mix all ingredients in a large bowl until well combined. Roll meat mixture into 1-inch meatballs (about 1 tablespoon each). I use a small measuring scoop to get even sized meatballs. If the meat mixture sticks to your hands too much, moisten hands slightly with water. Arrange meatballs on baking sheet. Divide meatballs among baguette halves, top with carrots (leaving excess liquid in the bowl), cilantro, and other vegetables (if using). Press on tops and serve. Uncooked meatballs can be 1 day ahead, covered and chilled. Cooked meatballs can be stored in the freezer for 1-2 months. Recipe adapted from Bon Appétit, January 2010. Yum … wish I had this for dinner right now! We’ll have it for lunch the next time you come over. looks delicious! 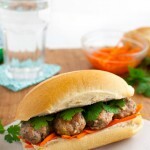 love banh mi sandiwches, never tried a meatball version before! If you love banh mi sandwiches, you will love this version! I love a good banh mi sandwich too! I hope you like all the other recipes just as much. Thank you so much for coming back to leave a comment and telling others about my blog!